Hillsboro City Schools officials are pictured at the 22nd annual Four County School Board meeting held recently at Laureal Oaks Career Campus in Wilmington. The Hillsboro City Schools received awards at the 22nd annual Four County School Board meeting held recently at Laurel Oaks Career Campus. * Hillsboro Intermediate Principal James Rhoades — ODE Momentum Award —presented by the Ohio Board of Education recognizing districts and schools for exceeding expectations in student growth for the year. School must earn straight A’s on all Value Added measures on the state report card. * Hillsboro Intermediate Principal James Rhoades — High Progress Schools of Honor — Recognizes schools that have sustained high achievement and substantial progress while serving a significant number of economically disadvantaged students. * Hillsboro Early Childhood Center Principal Pam Hollon — Overall A Award — Presented by the Ohio Board of Education recognizing districts and schools that earned straight A’s on all their applicable report card measures. 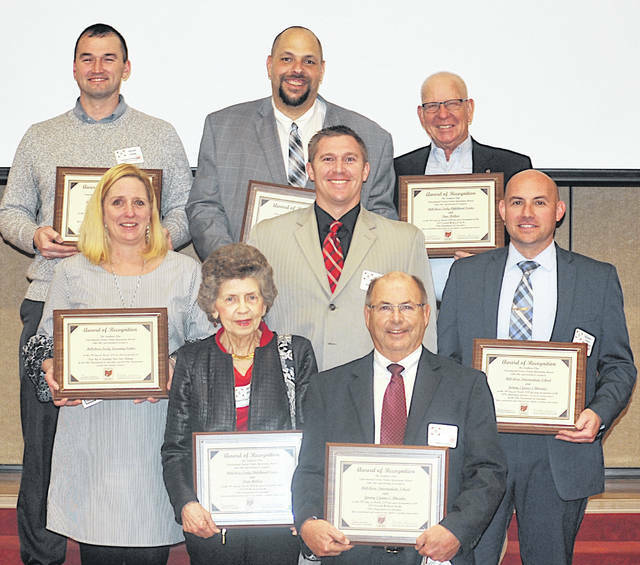 * Rhoades and Hollon — Overall A Award — Presented by the Ohio Board of Education recognizing schools that earnedan overall A on their report card. * Hillsboro High School Principal Joe Turner — Purple Star School — Recognizes schools that show a major commitment to students and families connection to the nation’s military. * Hillsboro City Schools and Hollon — Step Up To Quality 5 Star Rating — A star quality rating and improvement system administered by the ODE and the Ohio Department of Job and Family Services that recognizes and promotes learning and development programs that meet quality standards that exceed licensing health and safety regulations. Submitted by Jenny Shelton, superintendent’s secretary, Hillsboro City Schools.